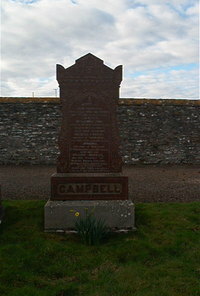 John Campbell died at Bridgend Swiney 3rd May 1901 aged 72. Wife Williamina Gunn died 10th February 1899 aged 74.
d Isabella S Grieve died in Tasmania 14th February 1907 aged 49.
d Johanna Campbell died in Montrose 13th March 1911 aged 50. Son William Duncan Campbell died at Newton Swiney Lybster 26th September 1920 aged 57. Wife Jessie Anne Gunn died at Lybster 1st May 1929 aged 68.